Art Napoleon's one-pot dish is designed to be cooked on an outdoor fire in a Dutch oven, but will also work in an indoor oven. Heat the Dutch oven over the flames of your fire and add 3 tablespoons of the butter along with the stock, onions, garlic and potatoes. Cover and allow to steam until potatoes are half-cooked, about 10 minutes. When the spuds are ready, add the corn, cover and cook for 5 minutes. Add more stock if the liquid is running low, as the vegetables have to steam. Add the clams, salmon fillet, wine, salt and pepper and seaweed and cook until the clams begin to open and salmon starts to turn pink. 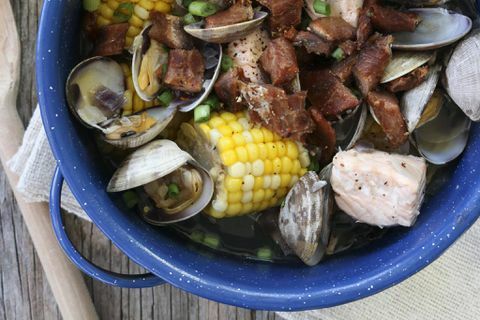 Remove from the heat, add the smoked or candied salmon as a topping, place lid back on and keep the clambake warm at the fire’s edge. Just before serving, strain the liquid from the pot into a saucepan and add the remaining butter and the fresh herbs, and whisk over medium heat. Pour the sauce into small serving bowls and use as a dipping sauce for the clambake. Serve hot.